The Church of The Transfiguration Evangelization Leadership Team encourages and inspires parishioners and all who look to our parish as a beacon of faith, to live the Gospel, responding to and fulfilling Christ’s great commission: “Go therefore and make disciples of all nations.” We seek to cultivate an atmosphere in our Church that is supportive to the ultimate conversion and development of a personal relationship with the Risen Christ. It is also our mission to support the Pastor, Pastoral Staff, the Pastoral Council, and Ministry Teams in the ongoing work of discipleship. In the spring of 2014, the Church of the Transfiguration New Evangelization Leadership Team began exploring ways to encourage everyone in our parish to reflect upon and respond to the Lord’s call to discipleship in our lives. After much discussion and careful planning, “Project Discipleship” was begun to re-energize our faith community into one of hospitality and commitment, becoming the hands, the heart, and the feet of Christ; demonstrated through our love and compassion for our sisters and brothers in Christ. Five spiritual practices were highlighted as part of Project Discipleship and have become known as the “Five Marks of Discipleship”. *What was first envisioned as a yearlong process should now become the touchstone for all our parish programs and activities including our strategic plan: “Growing Together as Disciples” and the mandate that it sets for Evangelization – Sharing the Joy of the Gospel. We invite you to consider making the Five Marks of Discipleship part of your spiritual life. 1) SUNDAY WORSHIP – The Eucharist is the “Source and Summit” of our lives. Attending Mass each weekend is at the heart of what it means to be a disciple. It is through the Eucharist that the work of our redemption is accomplished and we are enabled to express in our lives the mystery of Christ. (The Constitution on the Sacred Liturgy). 2) DAILY PRAYER –– Prayer is a conversation with God enabling us to grow in our relationship with the Lord. It includes praising and thanking God for all our gifts; asking God for all we need to live faith-filled lives; praying for forgiveness of our sins; remembering others in prayer. Prayer includes vocal prayer, meditation or contemplation. Prayer can be rooted in scripture or a particular devotion. Praying can happen anywhere, in traffic, in church, while folding clothes, while sitting in a quiet spot and centering oneself on the presence of God in one’s life. 3) STUDYING THE SCRIPTURES –– To unleash the power of the Scriptures in our lives, we need to study them. Using a study Bible, such as “The Catholic Bible, Personal Study Edition” or taking part in scripture discussions and study groups is one way to come to a deeper understanding of the meaning of the Bible in our lives. When the Word is proclaimed at Mass, God speaks to us today. 4) SHARING OUR FAITH –– One mark of a disciple is to be able to share our own faith with another person. This can happen in many ways. Sharing the meaning of the Scriptures in small groups is one way. Having a Spiritual Director is another way. Developing spiritual friendships where one can easily talk about faith is another way. By sharing our faith we deepen our belief and ability to live consciously as a disciple. 5) STEWARDSHIP OF TIME, TALENT AND TREASURE ––Disciples serve others. 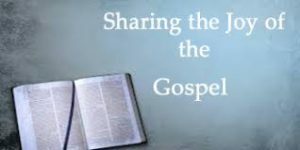 Service is at the core of the Gospel message. Service includes sharing one’s time to be of assistance in both Church ministry and “ministry in the world”. Stewardship also includes sharing one’s talents to build up the Church and to build a better world. Donating money or goods for the sake of contributing to the Church and the reign of God on earth is also a vital part of stewardship. To communicate a consistent and positive concept of evangelization. To assess the level of evangelization that is already taking place within the parish. Build on successful programs and facilitate the development of additional programs where voids exist. To address the engagement and spiritual renewal of both active and minimally involved parishioners helping foster and deepen each parishioner’s personal bond of faith and commitment to the community. To explore ways to reach out to inactive Catholics and those who do not profess any religious faith. To collaborate with the councils, commissions, ministry teams and outreach organizations of the parish to strengthen our parish’s commitment to evangelization. (Strengthen our commitment to Evangelization). A) Parishioners will experience pride in our beliefs. B) Parishioners will invite others to share our faith. A. Working in collaboration with one another, the Pastoral Staff, the Adult Christian Formation Team, the Community Life Team and the Evangelization Leadership Team, will continue to provide ongoing educational programs about the Catholic faith including teachings on the sacraments, liturgy, scripture, traditions, practices, ethics, the documents of Vatican II, and the history of our parish giving parishioners the opportunity to learn more about our beliefs and to begin to develop pride in these beliefs, traditions and practices. B. Understanding our mission as a “welcoming Eucharistic Community” and being spiritually enriched by our parish’s Prayer and Worship, Community Life Activities, Religious Formation Programs, Discipleship and our Outreach Organizations, parishioners will be inspired to invite others to share our faith. Working in collaboration with one another, the Pastoral Staff, the Evangelization Leadership Team, and members of the Adult Christian Formation Team will support and help to develop additional programs to encourage and facilitate faith sharing among parishioners. Following the example of the Pastoral Staff, Pastoral Council, the members of the Evangelization Leadership Team, and the First Impressions Ministry Team, each parishioner will be encouraged to Model Christian Hospitality in welcoming all who come to the Church. The Evangelization Leadership Team in collaboration with the Pastoral Council and Community Life Teams will work to welcome and integrate new parishioners into parish life by facilitating a gathering for newly registered parishioners to introduce them to our many parish ministries and programs, with special emphasis on Discipleship.